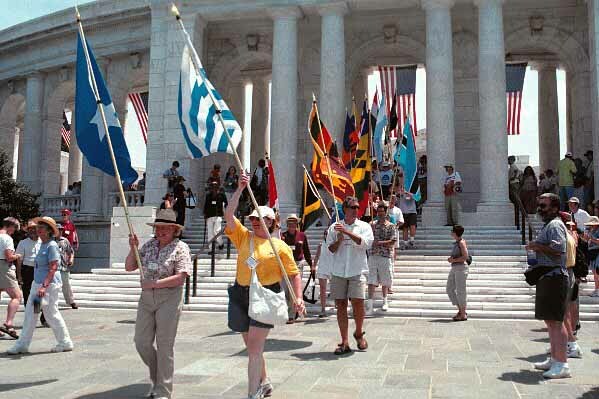 Caption: Returned Peace Corps Volunteers at the ampitheatre at Arlington National Cemetary during the Peace Corps 40th plus one organized and sponsored by the National Peace Corps Association in 2002. On the first weekend of August I attended the Annual General Meeting of the National Peace Corps Association (NPCA) in sunny bright Portland, Oregon. Peace Corps Writers held two workshops on Peace Corps writing, presented a reading by Sarah Erdman, who served in Cote d'Ivoire, from her wonderful new book, Nine Hills to Nambonkaha: Two Years in the Heart of an African Village, and announced the winners of the Peace Corps Writers books awards of 2003. About 225 Returned Peace Corps Volunteers (RPCVs) attended this weekend conference, which was also the annual meeting of the NPCA and featured a farewell dinner for the outgoing President and CEO of the NPCA, Dane Smith, and the introduction of Kevin Quigley, the new president of our alumnae group. Kevin was a Peace Corps Volunteer in Thailand from 1976-79. The purpose of this email is to ask for your help in 'saving' the NPCA by helping Kevin Quigley and the NPCA. I believe strongly that the organization needs a new vision and a new direction, and that if we don't help the NPCA now it will slip away into history. The first RPCV Conference I attended was in 1965, held at the U.S. State Department, less than a year after I returned from Ethiopia. At the time only 3,000 Volunteers had returned from the developing world. The Conference, which was put on by the Peace Corps, was called "Citizens in a Time of Change" and was held on the weekend of March 1, the organization's fourth anniversary. Its purpose was to discuss the RPCVs' role in national life. At the time, President Johnson was building a "Great Society" and declared that "a Great Society requires first of all Great Citizens, and the Peace Corps is a world-wide training school for Great Citizens." There were lots of misgivings among the Peace Corps staff in Washington about convening RPCVs in Washington. They knew Volunteers had come home with critical opinions about American's role in the world, the agency itself, and the Vietnam War. Many conservative PC/Washington types thought that inviting RPCVs to Washington to "sound off" within the hearing distance of Congress and the national news media was asking for trouble. Peace Corps Director Sargent Shriver, naturally, had greater faith in RPCVs. He believed the Peace Corps agency could "learn from the Volunteers' reflections after they had been home for a while." So we came to Washington. In fact, over a thousand of the 3,000 Returned Peace Corps Volunteers came to Foggy Bottom and the State Department to meet with over 250 leaders of American society. Everyone who was there will long remember Vice-President Humphrey linking arms with Harry Belafonte, Chief Justice Earl Warren, Secretary of State Dean Rusk, Secretary of Defense Robert McNamara, Shriver, and all the RPCVs to sing "We Shall Overcome" in the stately State Department auditorium. That night Humphrey urged us to get involved. "You don't really have to save the world," he told us, "just start saving the hometown." We left D.C. thinking we could do both. On the 20th anniversary of the Peace Corps, the Washington, D.C. RPCV group organized a weekend gathering at Howard University that was a great celebration of the early years of the agency and featured a stirring speech by Shriver and the introduction of the new Peace Corps Director, Loret Miller Ruppe who proved over time, (in spite of her limited overseas experience) to be a worthy director. 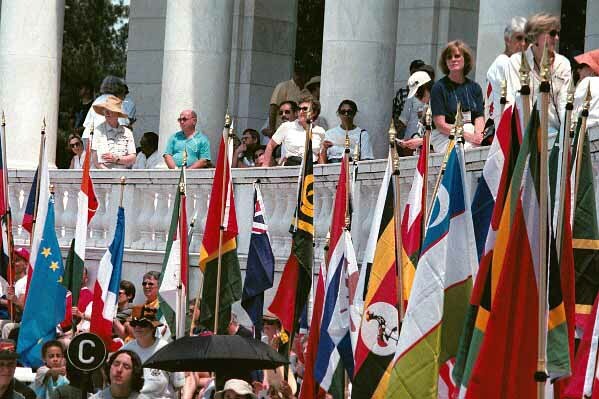 The largest gathering of RPCVs ever took place in 1986 when 5000 of us again went to Washington, D.C. where the 25th anniversary of the Peace Corps was celebrated inside the largest tent ever raised on The Mall, at the foot of the Capitol Dome and adjacent to the Air and Space Museum. The 25th Anniversary Celebration was the idea of RPCV Bill Carey, and four RPCV groups who came together under one banner to host an event which made headline news across the country, a great gathering of the "clan." Once again staffers at the Peace Corps agency were against the gathering, fearing that RPCVs would march on President Reagan's White House. However, when Loret Ruppe realized it was going to happen whether she liked it or not, she elbowed her way into the planning and staged a show on Sunday evening at the Kennedy Center when once again Harry Belafonte led the 'clan' in singing "We Shall Overcome." 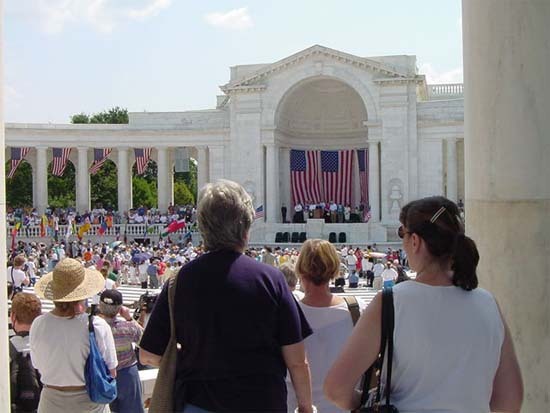 Earlier that Sunday Loret joined with Shriver, Moyers, and all of us at Arlington Cemetery for a moving memorial service honoring the Volunteers who had died in service. After the success of that wonderful weekend, those four groups of RPCVs established the National Council of Returned Peace Corps Volunteers (NCRPCV). Roger Landrum, a major force in creating the Conference, called for RPCVs to unite behind this new national forum. "If 10,000 of you will join the National Council," he told us, "we'll have a sustainable financial base. We can hire a staff, rent an office, and build a solid organization to develop our programs." Close to 16,000 of the Peace Corps community of RPCVs and staff, numbering around 120,000 at that time, did join together in those happy days after the gathering on the Mall. Many of us believed that a forceful alumni group of RPCVs would, as Sargent Shriver urged us, "Work at home as you have worked abroad, humbly, persistently, intelligently." The National Council of Returned Peace Corps Volunteers did have great dreams-publish a magazine that would tell about the world from an RPCV perspective, aid teachers in teaching about the developing world, pursue peace initiates, and build a network of RPCV groups across the country. In time, the NCRPCV changed its name to the National Peace Corps Association (NPCA). The organization has hosted conferences every year--in Eugene, Oregon (where the best Conference ever was held), in Kent State, back in Washington, D.C. and almost everywhere in between. Next year, in 2004, the conference will be held in Chicago. That is, if there is a next year, and if there is an NPCA. And that is the real point of this email. At the moment RPCVs have a membership organization without many members. The NPCA as an organization has slipped downhill since it began as a grass roots movement, one that briefly flowered, and is now, (to mix up all my metaphors), withering on the vine. What has happened since those glory days of 1965? Then President Johnson wrote to the Vice President saying, "The Peace Corps has made history," and called RPCVs "a major new national resource." Last year, at the 40+1 Anniversary of the agency less than 1,000 RPCVs (out of some 200,000 RPCVs and Staff) traveled to D.C. for the NPCA reunion. As an aging '60s Volunteer myself, I was stuck by the lack of young faces and new voices from the newest generations of RPCVs. Is the NPCA not providing appropriate services for the RPCVs to attract them to join the organization? What gives? RPCVs continue to--using Sarge's words---"serve, serve, serve." It is impressive to read what some RPCVs are doing as individuals--without the help or need of an NPCA--to serve the RPCV community. A couple of quick examples--Collin Tong (Thailand 1968-69) raised $40,000 from other RPCVs in a few weeks to run two ads in the New York Times urging a peaceful resolution to the crisis with Iraq; Hugh Pickens' (Peru 1971-73) PeaceCorpsOnline.org web site provides news, advocacy, and Peace Corps resources to over 60,000 monthly visitors, and sends notices of new articles monthly to more than 35,000 RPCVs; Marian Haley Beil (Ethiopia 1962-64) and I have published since 1989 a newsletter and now a bimonthly ezine - PeaceCorpsWriters.org -that promotes, encourages, and recognizes RPCVs doing a Third Goal activity with incredible impact-writing about their countries and their experience. So why join the NPCA? What good does it do? What good does it do if you have such good people as Collin Tong and others doing the job themselves? At the local level, at home, associating with a group in big cities like New York or San Francisco offers RPCVs a community of friends who shared a special experience and give RPCVs a chance to show their slides and sing their songs. Besides gathering for Ethiopian or Thai food, many of these local groups are doing valuable volunteer work in their communities. They are all impressive. But most of the members of these groups do not belong to the NPCA. Similar strength can be found in the RPCV groups formed around countries of service-and most of the members of these groups do not belong to the NPCA either. So why hasn't the national organization made a difference? Sixteen years after it was launched, the organization is in serious financial trouble, with a debt of some $100,000. None of this is new to anyone who has watched the NPCA grow and falter and keep struggling through the years. Here's an organization that started on a shoestring--but the string has frayed. Through the years Tim Carroll, Lyn Gray, Chic Dambach, Dane Smith, and now, Kevin Quigley have worked to grow it in various ways. While we now have a network for teachers, Worldview magazine, 3/1/61 newsletter, advocacy efforts, and a few other national programs, the national organization limps along with a paying membership of around 11,000 out of a Peace Corps world of 200,000 plus. Why is that? Why are there so few members at the national level? It's an easy answer. The NPCA does not (and you can pick any descriptive word): support, connect, relate, defend, help, assist, network, or promote individual RPCVs. The NPCA might look good on paper, and it can spin the accomplishments of individual members, but the NPCA is an empty suit. And as a lobbying group, we are not a factor inside the beltway or in the country. The reason we are not a "factor" is because we don't take any position as a group on any issue, or if we take a position it sounds like we're kindergarten kids - the recent statement on Iraq is a case in point. An organization that tries to embrace all the views of all the members is an organization that stands for nothing. How then do we make the NPCA effective? How do we save it? Create opportunities at the local level for Congress people to receive recognition from the NPCA for their support of the Peace Corps, ensuring that they recognize and realize that we are all voters. These are just a few suggestions to turn the NPCA into a membership organization that is for members. Many RPCVs have expressed these and similar ideas for the organization. And I am sure there are more good ideas in the country that need to be voiced. The previous leadership of the NPCA has spent time and energy trying to wrestling with "worldly" problems, i.e., going to Israel to "examine the relevance of NPCA peace-building experience to the polarized situation between Israelis and Palestinians" instead of using that energy to build and organization with members who themselves will be empowered to pursue such activities. Let's forget for the moment about being players on the "world stage" and concentrate on developing a "membership" organization that (1) defends Volunteers; (2) performs oversight of the Peace Corps itself; and (3) supports the volunteer work being done by RPCVs here at home. Let's give Kevin Quigley and his staff a chance to build the NPCA. Begin by contributing money to retire the $100,000 debt. Give Kevin the breathing room needed to expand the NPCA into a true membership organization that provides services to its members. If all 11,000 members contributed, the NPCA debt can be erased. Thank you for reading all of this. I am sending this email on my own, as someone who believes that RPCVs need a membership organization, and as someone who since 1964 has been working to promote the Peace Corps and RPCVs. I ask that you send Kevin a check today. I also ask if you would be kind enough to forward this email onto your network of RPCVs; many are not members of the National Peace Corps Association-ask them to join--as we have something of value in the Returned Peace Corps Volunteer Community and we need to use it. Let's save the NPCA, and then we can save the world. Again, thank you for reading all of this. John Coyne was a Peace Corps Volunteer in Addis Ababa, Ethiopia from 1962 to 1964. 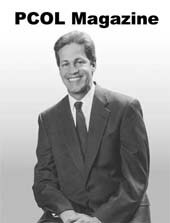 Since then he has worked as the Director of the New York Regional Recruiting Office of the Peace Corps and has been the editor of five books of collected works by Returned Peace Corps Volunteers. He is the founder and editor of Peace Corps Writers and co-founder with Barbara Ferris of the Peace Corps Fund. I will send money, when I see the NPCA put an attorney in charge of all separated Peae Corps Veterans issues with Peace Corps. It is no wonder they are in debt. They have cared about development issues only, why should people care about them? You were right that we should defend volunteers, perform oversight of Peace Corps itself, and provide RPCV's with resources back here in the states. I will get on the next train to DC to meet with Quigley, that is if he is sincere with resources for volunteers and RPCV's, but John the board are often the folks who make his decisions and I am not so sure some of the track records of these individuals is always on the volunteer's side. I fully concur with the steps you have outlined to "save" the NPCA, particularly the enhanced particpation of deep pocket RPCVs, the refocusing of Worldview, the membership suggestions and the career services for RPCVs. It is an organization well worth saving, in my humble opinion. I have recently proposed to the NY and CT RPCV groups that we set up a committee for an annual major fundraising "bash" in NYC (where we should be able to attact a crowd), the first to take place next year, to raise SIGNIFICANT money for NPCA, MEP, and for overseas and domestic grants in support of PCVs and RPCVs. I am hopeful that, in the NY area at least, such an annual event will also help inspire increased membership for NPCA, through publicity and networking. I continue to be astounded that NPCA membership levels have stagnated at such a small percentage of total RPCVs. I upgraded my participation to Director's Circle a couple of years ago, and recently renewed. As you suggested, I will send an additional contribution to NPCA to help with the immediate problem. I urge all those who read this to follow your suggestion and send what they can afford - NOW! Please free free to contact me if I can help your efforts in any way. I liked what I read. I personally like World View as it is. Not that there shouldn't be the type of publication you are advocating, if I understand it correctly, but I do think the existing World View is a world class magazine which fills an otherwise nearly vacant niche, incidentally admirably furthering the "third goal". I suggest publicizing it as it is with the aim of increasing its circulation beyond the RPCV community. (Creating the type of publication you envision could be a worthy separate project.) Could the existing magazine be made available to the general public, including but not limited to libraries and educational institutions generally, thereby hopefully bringing in some income to the NPCA through increased subscription revenues from non NPCA members? How have other worthy "niche" type magazines gone about reaching wider audiences when they have succeeded in doing so? PC 1964-69. In the beginning there was to be no PC "American Legion." Nevertheless in 1970, an ad-hoc "Radical-RPCV's" group formed, (meeting in Wisconsin), in opposition to the Vietnam War. We were an embarrassment to "good-RPCV's"
In recent years, our country has drifted into crisis again. Far beyond the normal ebb and flow of party politics, a rogue imperial administration has unleashed the US military might upon civilians in weakened war-racked innocent countries. Third-world countries that I worked, lived and traveled in. When host country co-workers and friends are under attack; when tons of bombs, many thousands of bombs rain down on decimated countries, -- where is the "PEACE" Corps? Where are the 200,000 RPCV's? Where is their leadership organization? Yes, I understand, it's business as usual. Funding a few slots for a few volunteers here and there. It's "the volunteer experience" that counts. Involve a few kids at home. Penny campaigns, one heart at a time. Well, after 40-years, what has it brought us? Fly the flag and nuke the rag-heads? I look to NPCA to stand up for "Peace" and I find it so "inner-beltway" -- busy testifying and submitting. Lobbying a gutless Congress, for a few more volunteers here and there. Strictly business as usual. I can only wonder, "fiddling while Rome burns." We need a real RPCV organization, standing up to the PC Bureaucracy for individual PCV rights. We need a real PEACE Corps, funded and powerful; strong enough to stand up to Ike's Military Industrial Complex, strong enough to speak with a loud voice for our overseas coworkers, neighbors and friends. We need a new plan. Let's tap some deep-pocket RPCV's, so we can bribe a few more Congressional Representatives. Let's debate the format of World View magazine. Let's find a few slots for some kids, at poverty wages, while others walk off with millions and billions. That should keep the folks at PC and NPCA busy. Sure. Sorry folks, you're not even speaking my language. Ine Barake! As we would say in Mali. "you and your work". Thank god someone took a strong stand and spoke the words " We need a real RPCV organization, standing up to the PC Bureaucracy for Individual PCV rights". God Bless you my friend. You are right too. The Peace Corps 200,000 RPCV's should be stronger at home and in their communities educating and enlightening people to the dangers of ignorance, the inclination for violence because of a foriegn policy break down, and a real decline in finding the similarities of our cultures vs our differences. By the way, does the Peace Corps directly fund some of the NPCA? Or share programs? Because "the bureaucracy at the NPCA and the Peace Corps" sure look and smell the same. You are right, most RPCV want a quality organization they can point their finger to and "say locally in their community, you should join the Peace Corps to share skills, learn, eliminate poverty, ignorance, and so on", to make a better place here and throughout the world. Personally, I always encourage people to go, but always give them the real story too. I will not lie to them about the bureacracy. Peace starts with a handshake. I think some of the Board of Directors, the Congressional Peace Corps folks and the crowd that only wants to fund programs overseas at the NPCA should start extending their hands to (in their minds radical RPCV's or the third world types). Most of you have had your opportunity to espouse your ideas with the resources behind them such as a member of the Peace Corps staff or as an RPCV Board Member. It is time to extend the olive branch so we all have a voice and the NPCA will be stronger for it. (By the way, I for more programs overseas through the NPCA, but the prorities should be PCV Rights and education at home first.